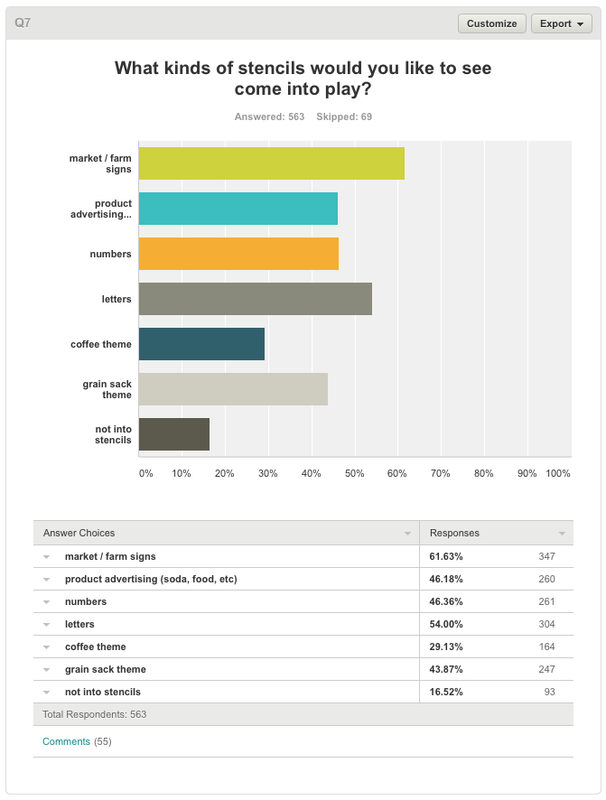 I kinda think one of the best, if not bravest things a business can do, is host a survey for their readers / customers. My reason for hosting a survey was to see where my own strengths and weaknesses currently were. And was I hitting on topics that truly interested you? The survey is still up, so if you’d like to chime in, CLICK HERE. And thanks! It all helps! This one astonished me. I guess a blogger just assumes they will attract like minded readers that do the same thing. But I couldn’t have been more wrong. And am soooo grateful to know this! Does it matter? Yes and no. While my style of projects and write ups cater to both, my challenges and events have not. So I’m going to change that. Starting Thursday, both bloggers and non are welcome to join the Heap of Change purging and cleaning challenge! You can join two different ways. Bloggers can link up to the post, and non bloggers can share their pictures on my Facebook page. Watch for more info on Thursday! The weekend link party will now cater to both kinds of readers too. Please scroll down to Q9 for more. 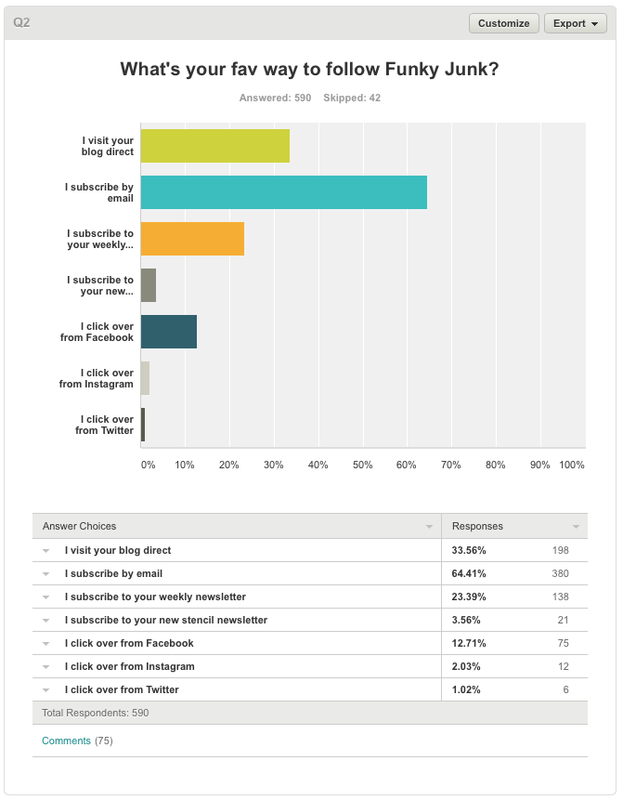 Most of you follow by email. And in all honestly, that’s the safest route. With social media being unreliable at delivering blog post alerts, this way you get it delivered to you direct. You can follow the weekly newsletter HERE. And the new old signs / stencils newsletter HERE. Thanks for your interest! I’ll ensure to add this more clearly on my blog side bar soon. In comments, your most common reply was, you liked my writing style. Whatever that is, thanks! And while blogging topics hit the lowest, I’ll still add the odd one in the mix for good measure. And a few of you mentioned projects that could be done in a non workshop environment. I’ll be sure to focus on the small stuff too! You also want to continue to see the failures along with the successes. I’ll be sure to show a few more of those… there are PLENTY to be had around here! This question confused most of you, so sorry about that. Bad english. In comments, a few were grateful I don’t do lots of sponsored posts, and some said they’d run if I got too commercial. Most just hoped I’d stay the way things are. Sounds good to me! Looks like we’re already on the right path, as you’d like to see more stencils come into play! Yay! Great to know! I promise to get on that topic more very soon! I’ve been pinched for space, and my stencils and paint area is nearly complete. In comments, most of you liked them all. Cool! In comments, most expressed an interest in a printed book over an ebook. I found that very good to know! Being that most of you are non bloggers, most of you didn’t even know what it was. Let’s fix that. I host a blogger’s link party every weekend.Bloggers create something, post it on their blogs, then bring the link over so you can visit their project from my blog. But there’s one thing I’m going to change. Non bloggers will have a way to play! Tune in this weekend, and there will be an invite to link a project you have created right on my Facebook page. We’d love to see what you create too, and this way, you don’t need a blog! So next time you make something up cycled, snap those pictures, and be ready to share them on Facebook! 🙂 Watch for the Friday prompt. Most of you were very happy with everything just the way it was. Thank-you! One issue I had forgotten about was, my blog loads slow or will load only half way on some smaller devices using Safari. I have the same issue on my laptop and it’s frustrating. All is ok on Chrome, so in a pinch, there’s that. But it needs to be fixed. I’ll be placing that work order tomorrow. Thanks for your patience and letting me know! Something that was repeated though was, to show less recaps. I actually wasn’t aware I overdid this. Now, I do link back to, say, my photo studio if I mention it in text, but I don’t always show a picture of what I talk about, so I’m uncertain if this meant just pictures , text links or both. I will at times use older pictures to tie in with a new storyline though, so maybe that’s what this meant? I have to honestly say, I’m grateful most love things as is. I really just wing it with completely everything I do. But it was super nice to know what interests you so I can add them to the list. Thanks everyone, for chiming in! If you have anything to add, feel free to share in comments! Or click HERE for the survey itself. Do any of these outcomes surprise you? Less cats? They are such cuties, how could anyone want less cats? I just asked my 3, who are all back on my bed, resting, but they were too tired to comment. I applaud how you respect your son’t privacy by not posting pictures of him but you involve him in your blog by recording his thoughts and involvement. There really is no way to please everyone, all of the time, but your blog is one I have followed since I began following how to blogs, so, to my mind, you are doing something right. Kudos to you Donna for asking and then sharing your Survey! I found it very helpful to understand what’s going on, instead of me being lost at “link, url, blah, blah blah”! Great job of making me learn something new! Linda, you just inspired a new post… a beginner’s guide to reading blogs and the internet. I think it’s needed! It would be nice to have a link to shoot those that ask the same questions. It’s on the list! I LOVE THE WAY YOU BLOG, it’s honest.. keep up the good work..!! I did not take the survey but my thoughts are pretty much on target with the results from others. I love your blog…a non-blogger myself. Don’t eliminate the cats. I am a cat lover, have lost both of mine to old age and enjoy seeing yours. So typical of cats, they need to be involved in the middle of all projects! Smaller projects for us without a shop would be great. I love creating with Junk, even though I have not done much of it myself; I love to see the creativity, learn about your thinking process along the way and see the results. I enjoy going to flea markets and finding things I can save, or re-purpose for family gifts. I follow your blog through e-mail and use bloglovin.com to collect and follow several multimedia, craft blogs. They give me inspiration to paint and create in my art journal. I always find yours fun and inspiring; you have courage and a great spirit to do what you love. Keep up the good work. 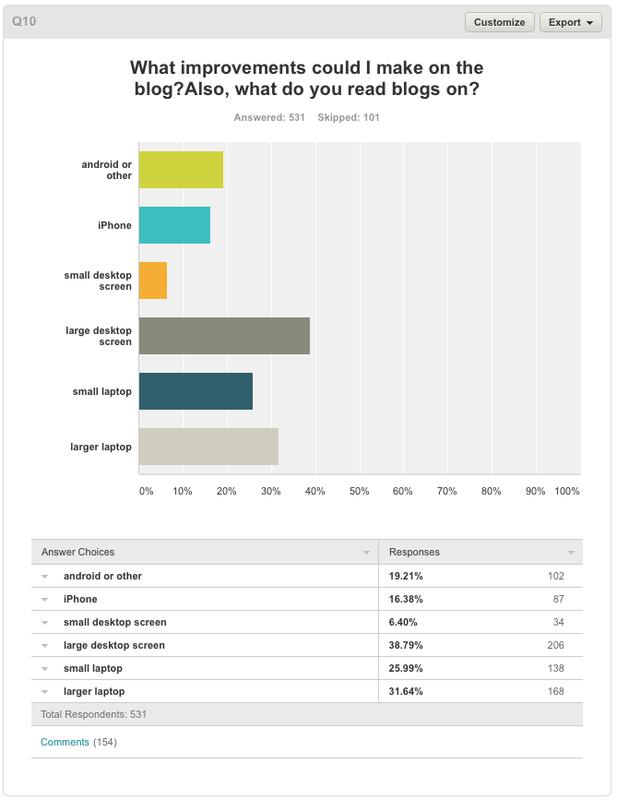 Great survey results – Here’s a tip someone share with me about slow blog loading. Save your pictures in a lower resolution for the web. Made a huge difference on my blog and it doesn’t effect the quality of the picture. Hey Carole, yes, I’ve tried that route too. I was losing quality though so I had to up it again. I’ll fiddle around a little more with the numbers. Thanks for the reminder! I actually just started receiving your newsletter and i love your conversational style of writing. Great blog! Thanks for subscribing and following along, Cathy! As far as the page loading, I have that issue on another blog I love too. Rain on a Tin Roof, addictided 2 decorating and a couple others I can not interact with at all and have no clue why! A I have is an IPhone not a PC. But I have not had any problems with yours. I do want to say thank you for all you give and share with us non bloggers daily. Well, this was a nice surprise to hear I wasn’t on the naughty list for once! haha I highly suggest you contact those bloggers and let them know if you haven’t already. We really do love knowing the issues others have so we have an opportunity to fix them. Thanks for your wonderful feedback! I am surprised so many people want to see cats so much. I do like them but..Humm…maybe I need to get a cat! Haha I know! But I’m secretly so glad, because they are part of our home, and I personally think something ‘live’ brings a picture to life. I allow them to wander in any time they wish and if the pic turns out, it stays. I think there is a HUGE untapped resource of folks like me who don’t have a decorating-type blog but who do great projects and feel SO LEFT OUT of all the fun of sharing! I don’t think ANYONE has figured out how to include us! I LOVE your Facebook idea! Thanks for thinking of us! Yours is my F-A-V-O-R-I-T-E blog so don’t change too much, OK? You are REAL and I love that about you. :o) And, being a non-blogger myself, I totally agree with MJ! We’d love to have an outlet to share our work once in a while. Keep on keeping on, GF. This is an official open invitation… any time I share something on my Facebook page, you are always welcome to link a like minded project of your own under it. Maybe what I’ll do at least once a week is throw out a prompt where any project is ok to share? Let me know what you think we need and when and I’ll make it happen! Thanks, Donna! We non-bloggers can share photos in the comments section of a Facebook post of yours, along with our comment. This is what you’re talking about, right? We don’t need to link to a Facebook post of ours? Regardless of which way you intended the question/comment about your cats.. as a cat lover and owner myself, I would miss seeing those posts should you decide to do away with them. I enjoy seeing others pets and your two remind of two I lost early last year. They were also Tuxedo cats and I miss them terribly. didn’t realize you have a party link. I’ll have to look for it. I use to rush in on saturdays to watch an paper crafter live online. I do a lot paper crafting, mainly, but would love to get into some of the creating you do with wood, junk, etc. I don’t understand why people don’t want to see stuff about your cats. I think they are so cute. They just add a more human aspect (hmmm?) to your posts. It shows you care about other things besides junk. I love to read about your travels as well. Just goes to show you how different we all are!! Keep up the great work. 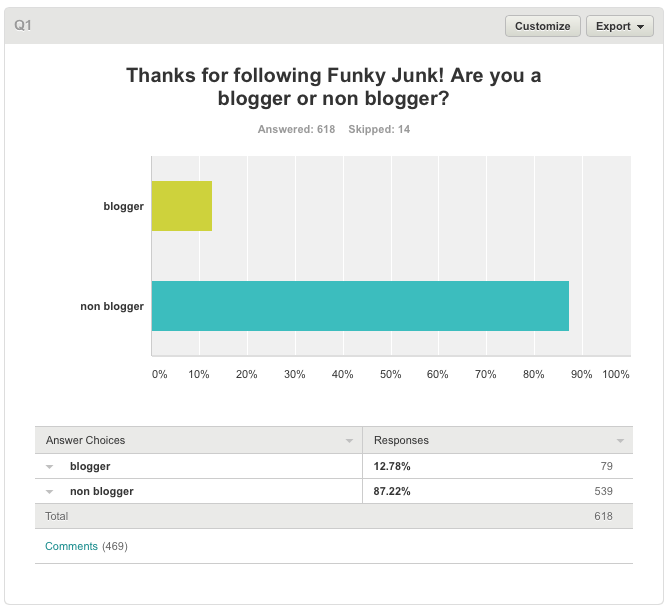 I gasped out loud when I read that most of your readers were non-bloggers. That one really surprised me because like you mentioned, you’d assume bloggers attract other bloggers. That is awesome Donna! 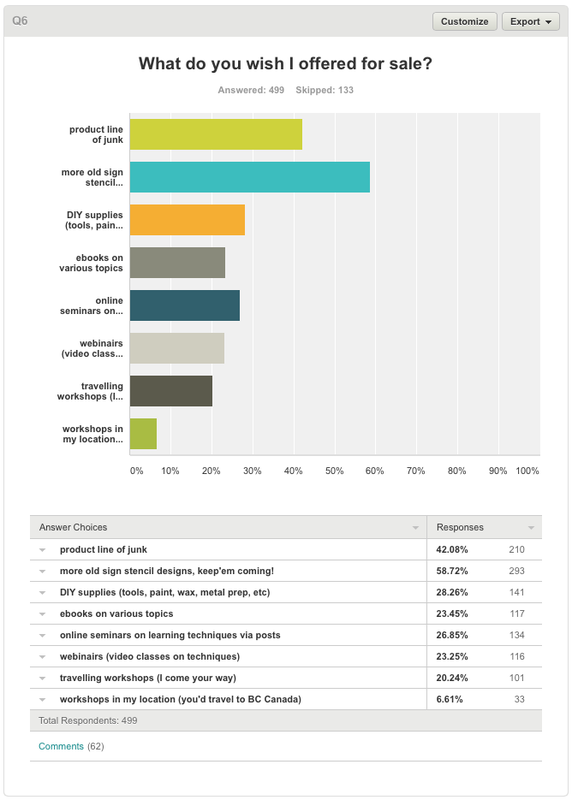 I’m excited to see where you take some of that feedback (an e-book or printed, stencil line, product line). 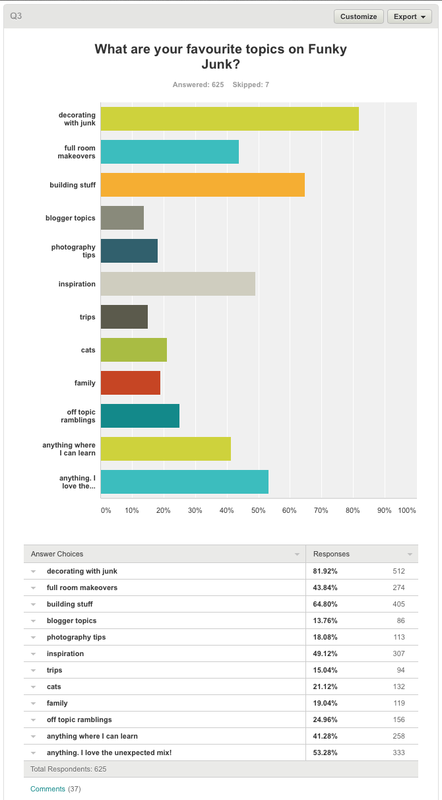 The bottom line is that this survey clearly showed that we, your readers, love what you’re doing! Love that I will soon be able to post to your fb acct. Would love a series of paper books on various aspects of junky decor!!!!! – Painting, reclaimed wood, using power tools, lighting, upcycling, repurposing, etc. etc. Love your blog! Been watching for several years. I love the link parties!!!!!!! Love the link topics!!!! Keep on keeping on!!!!!! Blogging is a continuous learning process! What you learn today may be obsolete in a couple of years. I’m actually going back and trying to relearn so much I have already forgotten! Love your blog! Love how authentic you are! thanks for doing the survey! 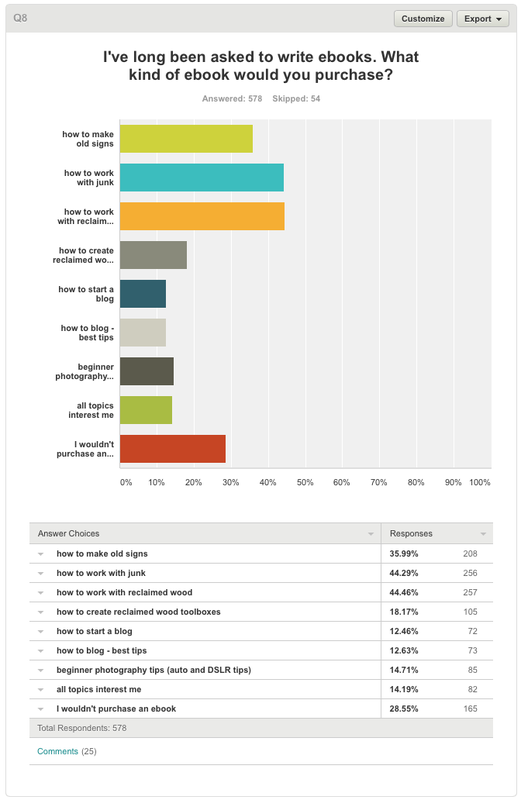 Question…do you use WordPress and was the survey a plugin? I would like to do one soon but not sure how? Thanks! Although I am not a cat person – I would miss them. Your cats have personality! 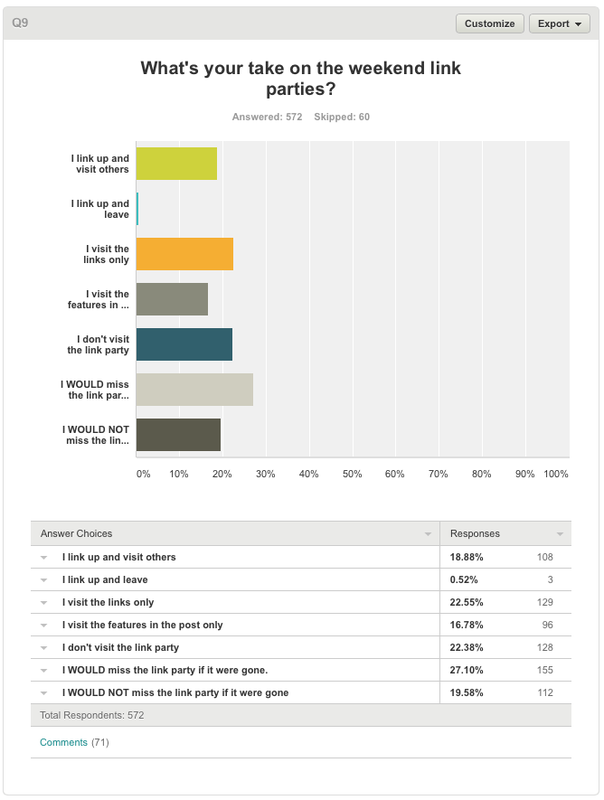 Thanks for sharing the survey results. I enjoy anything everything you want to share, you are one gifted lady! And another vote for cats here, too, please! 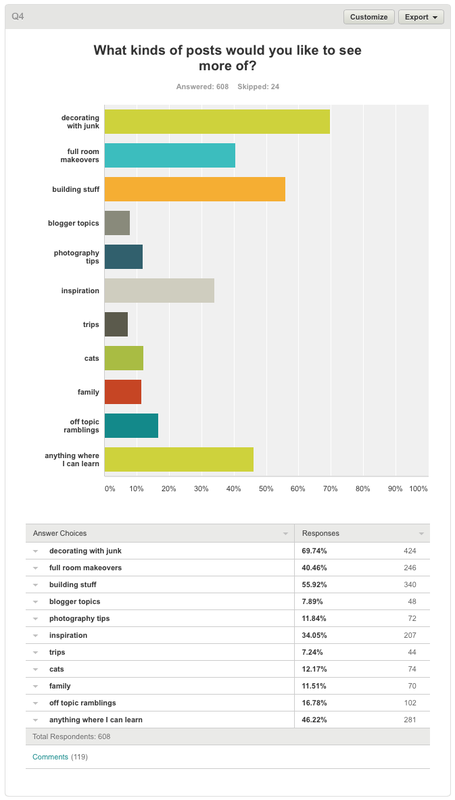 🙂 I think it was brave of you to do this survey because it isn’t always easy to hear criticism, but brava to you for being so determined to use that information to improve your blog. Not that I think your blog needs improving, mind…I love it as is…it’s my absolute favourite! But I do hope this information will bring you some new readership! I’d like to echo what some other readers said in regards to seeing some posts about how to work with power tools. I’m fine with a drill and maybe a nail-gun…but get me around a saw of any sort and I can feel my knees buckle…they frighten the living daylights out of me! I always have to have my wood cut to size for me, but I’d love to become more comfortable around saws so I could do it myself. Any tips you could provide in regards to working with power tools would really be greatly appreciated, though! Please keep telling us about the cats. If you write about something I am not interested in, I skip it. I NEVER skip the cats. My two are upset right now because my husband went to the store and took the dogs and left the cats home. The youngest one, Lucy cries when the dogs are gone. When they calm down I will ask them about less cats. I already know their answer. Truly your blog content has captured my imagination over the last year, and I wouldn’t miss one. I’m one of your non-bloggers, so I’m glad you know about us now. You have inspired many ideas in my home, not to mention the junk in the back yard the owners left. Now when I look at that mess all I want to do is incorporate it into my decor. Keep up the great work. God Bless you. Cats…YES!!! I love looking at pictures in blogs, and sometimes there is a dog flopped on the floor or cats nestled into a sofa only the way cats do. All I can do is smile. It spells H.O.M.E. to me. I knew you were on the right track with your blog. Now, your survey verifies it. Donna, you are doing good work. We love spending time with you. What you give to people are things like a boost in their confidence and encouragement. I was referring a blogger to your site earlier today, and I described you as a cheerleader. We all need cheerleaders, and we can all be cheerleaders. Life is too short not to! Best wishes. Hi Donna….being a newby to the wonderful world of Funky Junk Interiors I am inspired constantly by all I’ve had a chance to read and absorb. My 2015 New Year’s resolution is out with the old in with the new. I just don’t know where to start :-). Keep up the great work Donna. I’m looking forward to implementing some of your ideas in my own home. Please don’t EVER stop blogging about your precious cats. My cats are a constant source of love and joy in my life!! Hi, Donna! 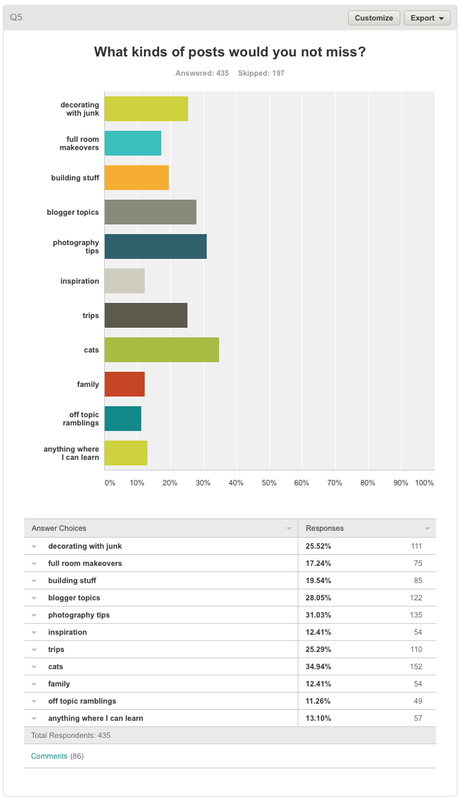 Thanks so much for posting your survey and the results! I’ve been wanting to know more about my readers and customers too, so you’ve given me a tool to find out more about them – and I appreciate it soooo much! LOL. I think from the comments everyone loves your blog and really loves your cats and your honest and fun way of presentation. I do not desire a lot of changes but am always open to them. Keep up the GREAT work Donna. You Rock! I’m new to your blog (how did that happen I don’t know). So glad to have found you and will be joining the Heap of Change challenge. Love the survey and what interesting responses. I’m reading some older posts to get to know you a bit better. That was helpful to all of us junker/vintage bloggers! Thanks for posting! Did you create the survey yourself, or did you have some tech help? Would love to hear more details. It’s so good to keep a pulse on our readers! Congrats on the new stencil line…perfect business for you! Hi Lora! I created it myself in Survey Monkey. Just beware… it costs $ after 100 replies. I’d investigate some free options first.